When it comes to classroom management, I believe that the most important thing a teacher can do is establish strong relationships with his/her students, and while I love when students are intrinsically motivated this is not always the reality of my classroom. 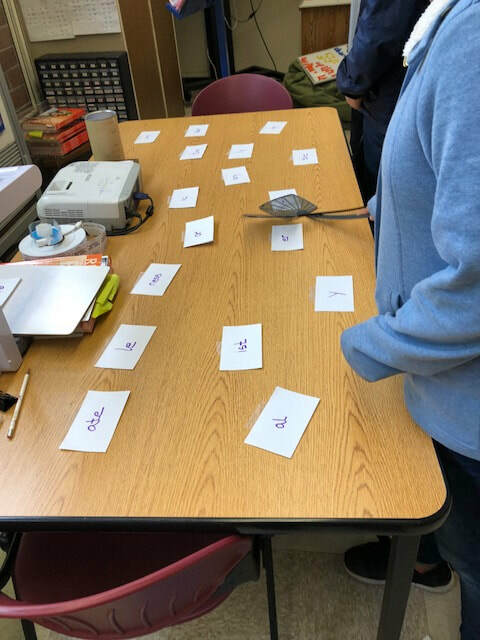 I work with older struggling readers, and so often before we've even begun there is a resistance to learning-- this is one of the reasons I do like to use a ticket system and provide tangible rewards. At the beginning of the year I use it to establish routines and certain behaviors, but towards the end of the year they are used more for encouragement, and as a "thank you for persevering even thought that was tough" reward. Recently, I was asked how to set up a ticket system when setting up a new classroom. I reflected on my process, and this chart is what I came up with. I have posted other blogs about menu items and specific ways to earn tickets linked here and here. I have word walls set up with common rimes of vowels patterns that we've learned in class. I ordered some sticky men on Amazon (very cheaply) and created a new "vertical board game." Students read until they get stuck, and that's where they put their man. Then it's the next person's turn. They loved it! 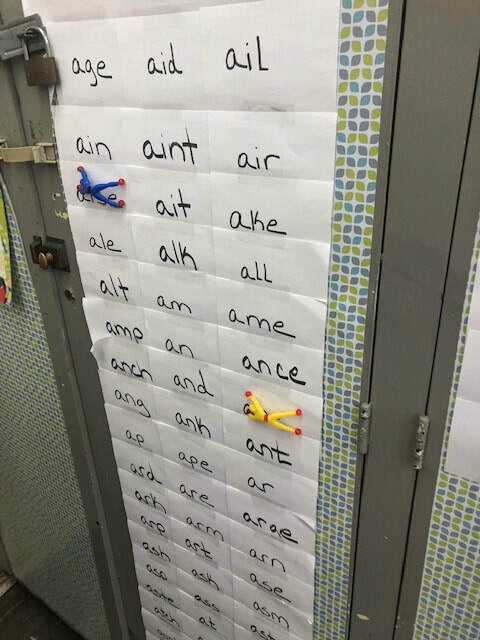 I've been reading some research lately, and several people have mentioned the importance of having students connect to the parts of irregular words that they ARE able to sound out. 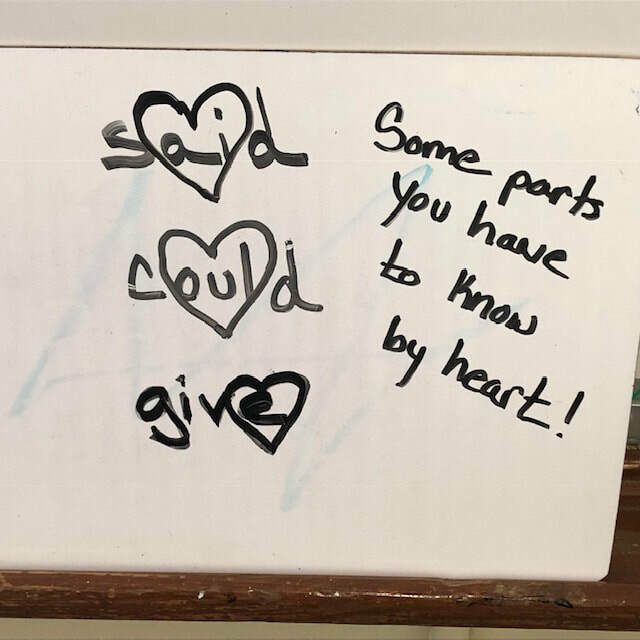 Then you tell them the part they just have to LEARN BY HEART you can help them remember this by actually drawing a heart around the irregular portion of the word. I heard this wonderful idea in a dyslexia workshop with Dr. Nancy Mather. Hopefully, you're able to use it with your students! I hope your school year is off to a wonderful start! I love the beginning of the school year: teaching classroom routines, conducting icebreaker activities, and the energy I have from a restful summer break! Previously, I've blogged about the importance of experiencing joy in the classroom: more-classroom-community-building-activities.html. Just to reiterate, this is so important because during the year your students are going to have to trust you. As teachers we are going to have to ask them to do some difficult things and to put themselves out there (I know that is true for me in my reading intervention program). If you've also had fun together it makes it easier to do some challenging work together. Volleyball- This is one of my favorite activities yet. We took 20 minutes on a Friday (minimum day to boot). I hung a piece of yarn to divide the classroom, got the chairs out, and a ballon out (see picture for set up). Then we played volleyball. While some teachers might use those Friday minimum days to show a movie, I'm a huge advocate of using time like that to build connections. This activity and MANY MORE available at: https://www.schoolreforminitiative.org/protocols/. 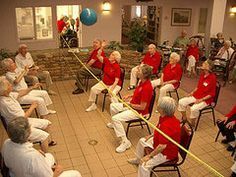 For this specific activity go to "Indoor Volleyball." Have students select something they want to read several weeks in advance. Great options: poems, scary stories, jokes, Chicken Soup for the Soul type stories, or weird true stories. Every student wanted to read jokes, so I put five on a page for each student. Have the students reading in groups, so they get to hear different stories (see picture of yellow paper). We rotated every 15 minutes, so we were able to be with different dogs and hear different stories. In preparation for the event we also worked on introducing ourselves, our story, and asking questions about our story to the small group. This was a great experience, and I hope to do it every year! This great game for kinesthetic learners can be played as a whole class or in a small group. 3. The first person to hit the target affix gets a point. Other Considerations: I like to make the rule that in order to get a point the student must hit the correct word part the first time. 3. Tape is put on the floor for the three teams to line up behind. Other Considerations: Conduct a practice round; tell students they must wait for you to finish reading the clue before they leave the line. Also, once they leave the line they cannot receive help from their group. The first person to hit the correct answer with their fly swatter wins the point for their team. Again, if they hit the wrong answer first, I do not give them the point. They then return to the line and give the flyswatter to the next person. Stand back and watch the fun! I like to have my clues written out for this fast-paced game. Download the sample to see the types of questions I ask. Below is a slide show of each piece of the portfolio (all documents are available in an editable version at the end of this blog). The only thing that I printed in color was the Table of Contents. I made copies of the portfolio documents on colored paper to match the table of contents. 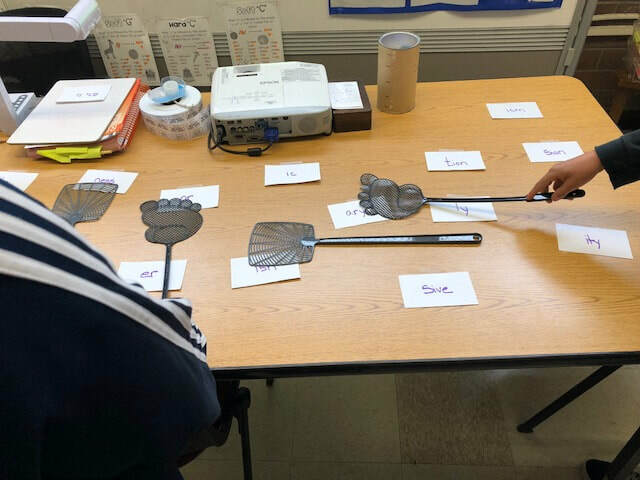 ​In order to prep the students for play we practiced several times in small groups (we do small group instruction in my class regularly). We would select a word for one person and then we would practice giving clues, which is the hardest part. 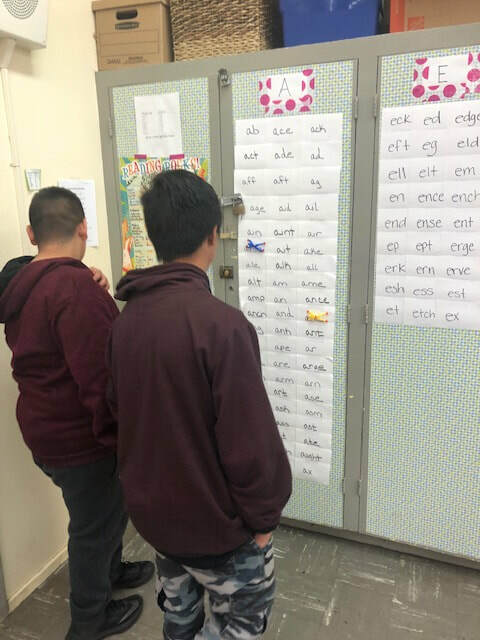 Students seemed to have the most difficulty coming up with a sentence that uses the word without giving away the word. During this practice period we discussed what made a good clue, and how we could make our clues better. 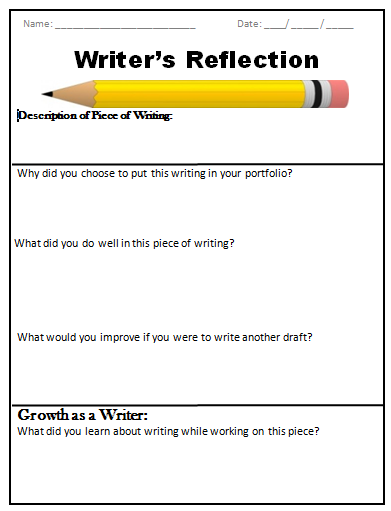 I also used this time to revise the activity and provide additional scaffolding. All of this was to get the students ready to play with the whole class. 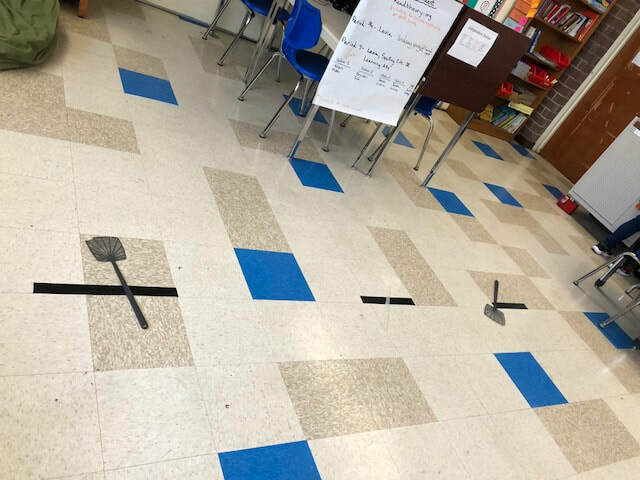 I would like to mention that the students enjoyed this so much and became so adept at doing it in small groups that they requested to do it during their independent work station. ​When we were ready for whole class play, I selected 13 words (that we have been working on since the beginning of the semester) and prepped the stickers for students. 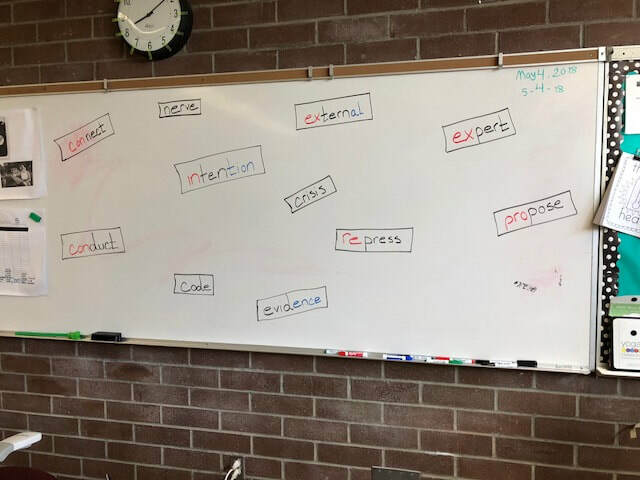 I wanted students to link four newly acquired vocabulary words together: process, connect, distinct, and admit. (This is a beneficial exercise by itself to help students retain vocabulary.) I came up with some generic sentence frames for those words (see picture on left). 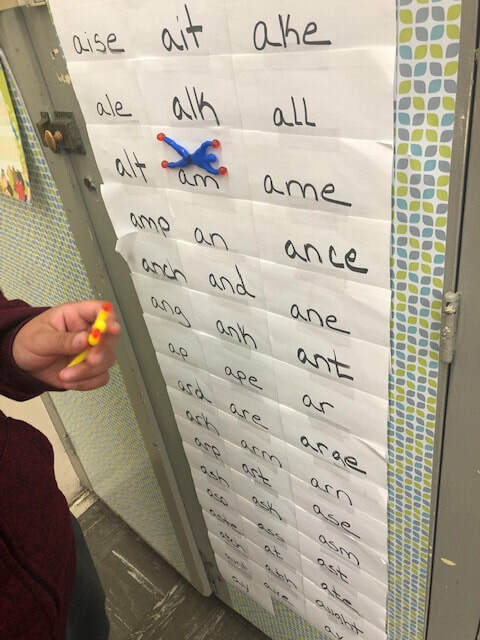 After we wrote the text, the students wanted to practice, practice, practice. It was wonderful to see them so motivated to work on their fluency. 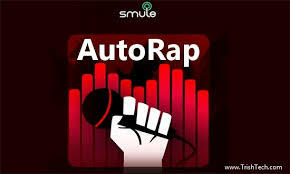 We even recorded ourselves once, the class gave some ways we could improve, and we did it again. I plan on doing this lesson again with four new vocabulary words. When I do it again, instead of using sentence frames, I'm going to bring in a picture and have the students tell a story about the picture incorporating the four new vocabulary words. I'll let you know how it goes!